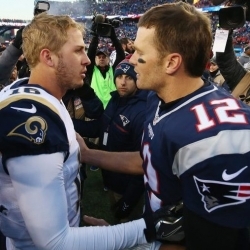 Jared Goff has +225 odds to win Super Bowl MVP, while Tom Brady has +110 odds to be voted the most valuable player. Super Bowl 53’s over/under bet is the highest in Super Bowl history at 58. It was higher (either 58.5 or 59) at most sportsbooks when the over/under was released, though betting action caused bookmakers to lower the bet by a point. The Action Network reported that 67% of the money and 58% of betting tickets took the “under” proposition in the first 24 hours of wagering, which caused oddsmakers to adjust the total to either 58 or even 57.5 at some betting shops. For his part, The Action Network’s Sean Koerner said the correct total based on NFL power ratings was 57.5. That would mean that sports bettors would be best served finding a sportsbook with an over/under of 58 and still betting the under. Sports betting experts say many smart bettors focused on the over/under bet, because so many mass market bettors are taking the New England Patriots as favorites in the point spread and money-line bets. While the Los Angeles Rams had a better regular season record, the Patriots’ experience and prestige give them the edge among the betting public. Others have focused on the myriad of prop bets, especially the odds on who will be Super Bowl MVP. As one might expect, Tom Brady leads all players with a +110 money-line bet total. Jared Goff is next with a +225 designation. Everyone beyond that point would be considered a long shot. Todd Gurley is third-best favorite with a +1400 betting line. His co-starter at the present, C.J. Anderson, is a compelling +2000 underdog. Gurley has been injured the past two months, but might be healthier for Super Bowl LIII. CJ Anderson was waived by two other teams this year, but appears to be the fresher back at this point. Their counterpart on the Patriots, Sony Michel, is a +1600 betting line to win the Super Bowl MVP. James White, the Patriots’ third down back, has odds of +2000. James White often gets 8 to 10 receptions in a game when the opponent has a stout pass rush, so White is an intriguing option. Many believed James White should have won the MVP award at Super Bowl 51, including Tom Brady (the winner). In fact, Tom Brady gave James White his prize money and the pickup truck awarded to the MVP in appreciation for White’s work. If he has another such game, the media members who vote might give James White the nod this time. For those wanting to wager on a defensive standout, likely NFC Defensive Player of the Year Aaron Donald is a +2000 bet. It is rare, but not unheard-of, for a defensive player to win the Super Bowl MVP, happening 9 times out of the 52 games. Two of the last five MVPs have been defensive players, though. Wide receivers and tight ends are good long shot bets, if they can have a superior game. On the Patriots, wide receiver Julian Edelman is +2500 and tight end Rob Gronkowski is +4000. Both have lots of experience in Super Bowls, while Edelman is second only to Jerry Rice in most NFL Playoff receiving records. The Rams’ two main wideouts, Brandin Cooks and Robert Woods, each have +4000 odds to win the Super Bowl MVP. Brandin Cooks just defeated his former team, the New Orleans Saints, in the NFC Championship Game. Now he has a chance to beat his other former NFL team, the New England Patriots, who traded Cooks to the Rams back in April 2018 for a 1st round pick and a 6th round pick. Wide receivers have won the Super Bowl MVP only five times — or six if you count Desmond Howard (who won as a kick returner and punt returner). A tight end has never won the Super Bowl MVP. The over/under bet of 58 is interesting to dissect. The game would have to end 31-28 to reach the over, or one team would have to blow out the other one. Super Bowls often start out with nervous play, which either leads to more of a defensive struggle than one would imagine or a blowout. After last year’s 41-33 game, though, or either of the league title games this year, reaching 59 might seem like child’s play. Also, bettors should remember that neither of these teams had a Top 10 defense this year. While both showed better in the playoffs, with the Rams’ struggles to stop the run and a suspect defensive backfield, Tom Brady and company could march down the field at times. Sony Michel, James White, and Rex Burkhead are a three-headed monster in the running game. This could be another shootout. Sean McVay’s offensive mind versus Bill Belichick’s defensive mind should be a stellar matchup. Belichick prefers to take away an offense’s strength, but that might hard to determine with the Rams’ offense. Todd Gurley normally would be the standout, but he has hardly been a factor in the playoffs. CJ Anderson has outplayed Gurley, but one wouldn’t expect CJ Anderson to be the focus of the Patriots’ defense. While Gurley’s health and return to form is important for the Rams, Jared Goff should be the key to the Super Bowl for the Rams. If he gets the time to spread the ball around and avoid mistakes, then Goff would be a huge favorite to win the Super Bowl MVP and push the score over the 58-point over/under. Todd Gurley or CJ Anderson would be a good narrative for media members (voters) to get behind, while Brandin Cooks also would be a good narrative. The same goes with Aaron Donald, who might be the key to the Rams slowing down Brady. This should be a close game if the Rams win, while the Patriots’ running attack and Tom Brady’s 3rd down efficiency could wear down the Rams defense in a semi-blowout. For that reason, if you think the Rams will win, it’s better to bet the “Over”; and if you think the Patriots will win, it might make more sense to bet the “Under”. Note: Any predictions or betting tips we make are for entertainment purposes. Bet on Super Bowl LIII at your own risk.